Once you have been approved to adopt you start the ‘matching’ process. Many prospective adopters choose to produce an eye catching flyer to send to agencies. You can find contact details for local authorities on our agency finder. This flyer should communicate all the important information about you and the child you are looking for. It’s important to give the information efficiently. We suggest keeping it to A4 but you could have a longer version which expands on the points you’ve made. Remember that placing agencies will view your profile with the child’s needs in mind. The template and guidance below gives you a few helpful pointers in making your profile stand out. 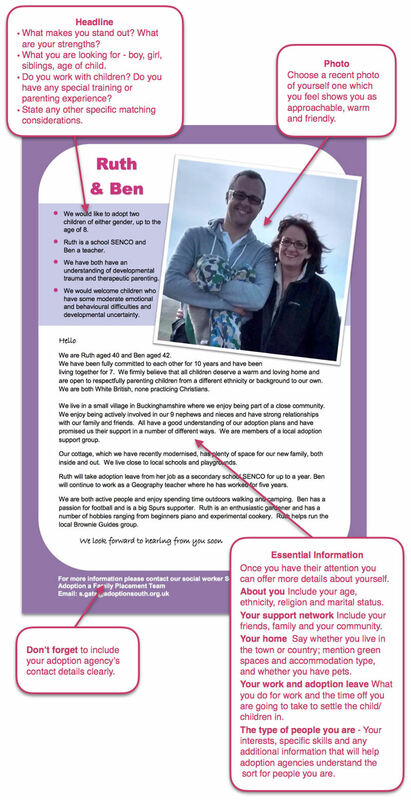 You can download the adopter profile template below in Word format and customise for your own use.